The Japanese, I am told, have a word for buying books that you want to read but never quite get around to – Tsundoku. 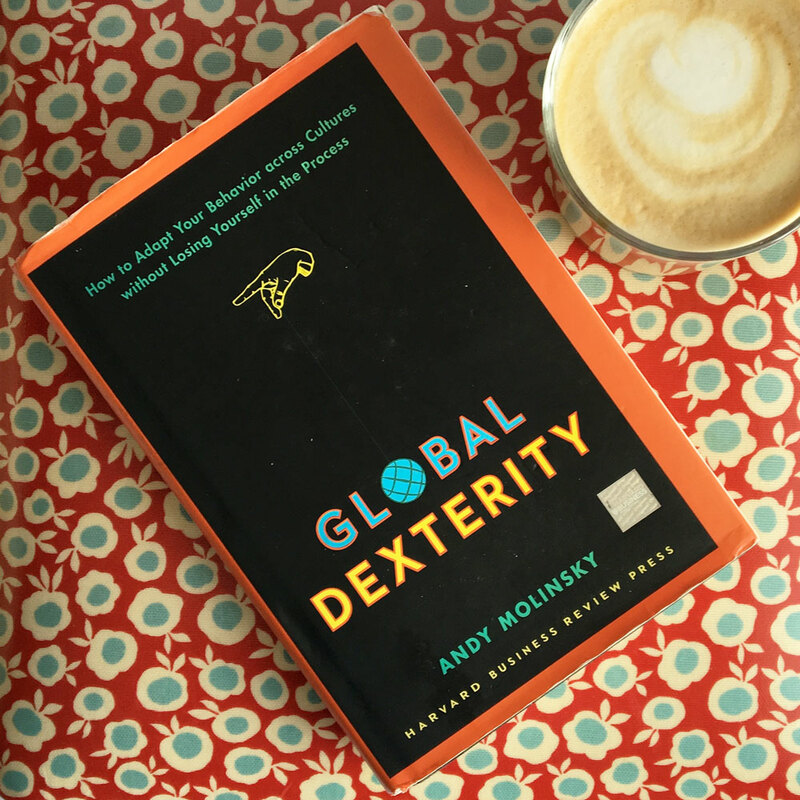 Well, I finally pulled out Andy Molinsky’s “Global Dexterity” from that towering pile and it’s a useful read, packed with real-life examples from Molinsky’s extensive experience in the corporate sector. For those of us not always working in the corporate world there are a couple of bits that jar a little, I found imagining my investment portfolio a bit hard, for example (! ), and it would have been great to have had a couple of examples from those needing global dexterity in their voluntary/public sector work. The “six dimensions of cultural style” are a useful starting point for understanding the basic differences in communication style but in being globally dexterous we would need to consider many other factors that might impact on our ease to manage or do business in a new culture: from differing concepts of time to how our gender, race or sexual orientation may impact on trust-building etc. Overall though, if you are about to take an overseas assignment or are recently arrived in a new cultural environment and want to know how to adapt your communication style, this should be on your reading list. Molinsky sets out that the key to successful cultural adaptation is learning how to change your behaviour to be appropriate and effective in that new setting, without losing your sense of self. He argues that it is not enough to simply understand these cultural differences (though this is a first step). Rather the focus should be on how you bridge those differences. His insights into the psychological challenges of adjusting to a new cultural environment are interesting. First he highlights the “authenticity challenge” – do we feel that the new behaviours expected of us conflict with our core values and beliefs? Second, we have the “competence challenge” – do we feel we have the skills and knowledge to adjust effectively? Third there is the “resentment challenge” – do we resent having to change, do we see what adjusting will give us? I wondered if there should also be a “superiority challenge” (we often feel that ‘our way is the best way’) but I guess that is just an extreme form of the resentment challenge! Molinsky argues that if we are aware of which of these challenges are biggest for us it can help us build some tailored strategies to help us bridge those gaps. There are lots of practical exercises in the book that can then help a new assignee build some strategies for adjusting and lots of useful ideas from observing cultural models to using a cultural mentor. He also reminds us that sometimes we won’t want to adjust if we feel this would ethically or morally be a compromise too far. So, if you’re about to become an international assignee or are recently arrived in a new cultural environment or even if you are coaching people to interview well in a culture that is not their own, you might want to get a hold of a copy and not leave it for too long in that aforementioned pile.